Every ceremony or rite has a value, if it is performed without alteration. A ceremony is a book in which a great deal is written. Anyone who understands can read it. One rite often contains more than a hundred books. I have written about Jon Mueller’s work twice in crow‘s first year; last June, I shared my enthusiasm for the scope of his projects, the fire at the heart of his fiercest drumming, and the imbued trance states I experienced more than once hearing him in performance. In July I wrote about what I called the ghost tones and howling partials that can be heard in the maelstroms Mueller generates with his snare rudiments and feedback system. Mueller whips and roils billows of those freak partials and clangorous overtones from his simple kit, until the ghost chorale can be heard. I know I am not alone in this perception; reading a little through Mueller’s site Rhythmplex, as I was thinking about another entry on his sound world, I came across a post in which he states that listeners attending his solo tour of the germinal piece for snare drum, electronics and auditory hallucinations, I almost expect to be remembered as a chair, reported they heard this same phenomenon. Then there is the business of formants; I won’t feign an understanding, nor a keen interest, in the particulars of frequency spectrums and other acoustic fundamentals. What has engaged me each time I have heard Mueller perform is the immediacy and visceral clout of his playing, the genuine sense of an aura or sound-field being made in real time. Through his sustained focus on these sorts of phenomena of sound, his ear for acoustic atmospheres [in the lineage of Lucier’s I Am Sitting In A Room], and the ritual gestures that frame his work of the past several years especially, Mueller is creating a whole environment in which the listener is invited to essentially become part of the feedback. Formants and other spectral phenomena may clarify to some extent the science of Mueller’s sonic auras; but of course only, forgive the pun, partially-as Wallace Stevens said about poetry, we must listen with our nerves. Mueller’s interest in resonance and amplitude is akin to that of the best musicians working in field recordings- imagine if Toshiya Tsunoda was a rock drummer-now add an engagement with instrument, the room and the listener as a rite, and you’ll approach the experience of Mueller’s recent solo percussion work. While Mueller’s solo performances and recordings of 2010-2011 depart somewhat from Gurdjieff’s stricture …performed without alteration, considered together they sound to me like a rite being worked out across several releases. In 2010, following a year of practicing the sustained, nearly hour-long snare roll that serves as the fundament for I Almost Expect To Be Remembered As A Chair, Mueller took the piece to venues around the U.S., leaving in his wake the aforementioned audience experience of hearing voices. 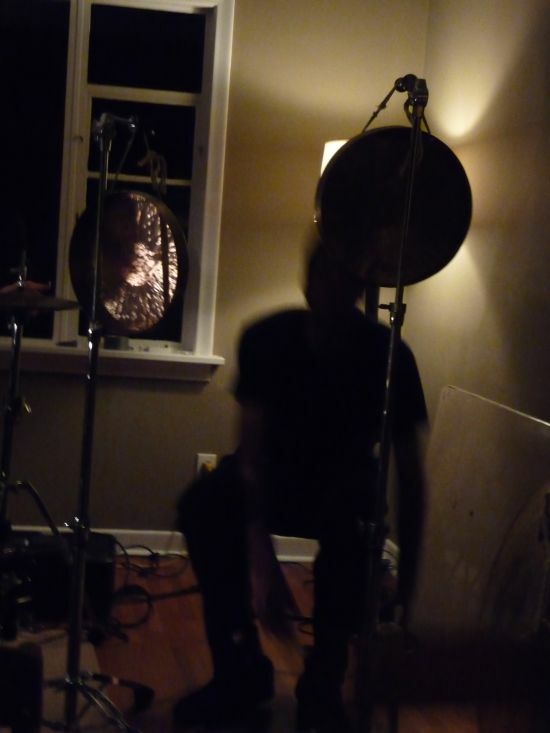 Last year saw the release of two related solo percussion albums; The Whole [Type records], for snare, tom drums, dulcimer and voice; and a very limited release on cassette, Halves, which is essentially Mueller fomenting the ghost chorale from the tapes and feedback he was employing on the road. The Whole is explicitly incantatory, beginning with a lovely scale on the dulcimer, accruing resonance and a ritual peak through layered vocals and percussion, returning to softly hammered strings, then silence. A residue of ceremony is easily felt, as if the work was lifted from whatever in situ space Mueller was conjuring in, documented on CD for the listener’s own private rite. Halves is well-suited for tape, its gong-clouds, scrap-metal overtones and cymbal shimmers sounding all the more densely clotted, buoyed by tape hiss. It is unfortunate Halves is not currently available; Evan and Travis created a lovely letter-pressed edition, with metallic gold and silver inks, real care given to Mueller’s multiple. As I have no doubt made clear, listening to Halves as part of a seamless whole, together with 2010’s other solo release, last summer’s performance, and the duo I linked to with Jason Kahn, makes it clear that Mueller’s current solo music can be heard as sonic multiples-or perhaps as the aural equivalent of the Shaker quilt that adorns the cover of The Whole. It is his rite for now, exacting in time and concentration [a year in his basement to develop the musculature and one-pointed focus to carry the ceremony to different cities! ], deeply personal yet greatly concerned with communication. I saw the affected listeners in the small gallery in which Mueller performed in Minneapolis last summer approach him, almost as soon as the rigorously demanding piece subsided to silence, to say something about what they has just experienced. I am confident we all experienced the ceremony Mueller has been shaping for a few years now, the hundred books being written. This entry was posted in music writing on February 15, 2011 by jessewgoin.